River Terrace Café enjoys a fantastic riverside setting on the River Ouse beside the historic Chapel Bridge and located in a Grade II* listed Manor House. Anita, Paul and all the team at River Terrace Café love serving great food and a wonderful experience to their diners. They also love the environment, the planet and its people. 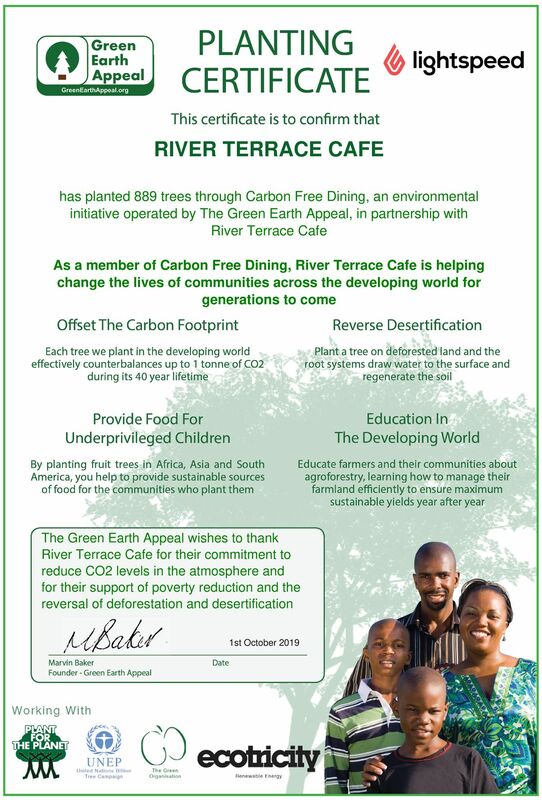 For each bill presented, River Terrace Café empowers its diners to plant a life-changing fruit tree in the developing world. Each tree will counterbalance the Carbon Footprint and Food Waste of the meals on that bill. Not only that, but the trees will help provide an end to poverty and a sustainable way of life for some of the world poorest communities.